The earth’s climate is being dangerously disrupted by warming of the atmosphere. That warming is mainly being caused by greenhouse pollution in the form of carbon dioxide and methane from humanity’s use of coal, oil and natural gas. The stark disagreements over the climate issue between Republican Ted Cruz and Democrat Beto O’Rourke start with the enormous difference in their views on that scientific consensus. He didn’t explicitly refer to the most recent report from the Intergovernmental Panel on Climate Change (IPCC), the world’s leading scientific body on the subject, in the Oct. 16 debate, but his “window is closing” statement was consistent with it. Issued on Oct. 8, the IPCC report warned that limiting harm by keeping the global average temperature from rising more than 1.5 degrees C (2.7 degrees F) will require “rapid, far-reaching and unprecedented changes in all aspects of society” to eliminate nearly half of the emissions of carbon dioxide, the main human-produced greenhouse gas, in just the next 12 years. In the debate, Cruz did not attack the mainstream scientific consensus, updated in the IPCC report, as he has done in the past. His attacks have drawn firm rebuttals from climate scientists, in one key instance from a researcher whose work Cruz had cited as a basis for challenging the consensus. 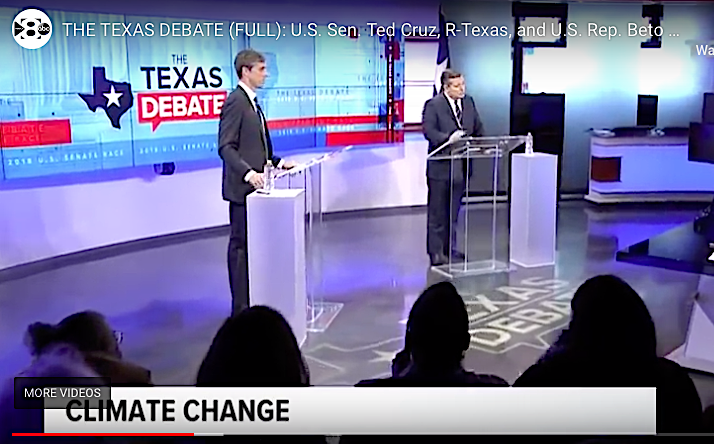 Cruz declined to answer a debate moderator’s question about whether he thought Texas-based Exxon-Mobil, the oil-and-gas giant, is wrong in endorsing the scientific consensus and saying climate change is a threat warranting action. The candidates’ dramatic differences on the science are naturally reflected in their respective views of the threats posed by climate disruption and the corresponding need to take action against them. Texas can play a crucial role in fighting climate change while enjoying the economic benefits of both its growing renewable energy industries and its traditional and thriving oil-and-gas industries, O’Rourke has argued. Many of his climate-action supporters would disagree with his debate assertion that deciding between renewable energy and fossil fuels is “a false choice,” but he has earned high ratings and ringing endorsements from environmental groups. In terms of policy, O’Rourke supports a U.S. return to the Paris Climate Agreement, a pollution-cutting accord that President Donald Trump has begun withdrawing from. To reduce greenhouse emissions to meet climate-protection goals, O’Rourke told a Houston Climate Forum in January, he sees “no better way” than placing “a price on carbon.” That is the central concept behind proposals for a carbon tax, an idea endorsed by diverse groups and individuals including Exxon-Mobil and Houston Republican James Baker, a former cabinet secretary under Presidents Ronald Reagan and George H. W. Bush. Instead of talking about threats posed by climate change, Cruz has chosen – in the race with O’Rourke and throughout his Senate career – to highlight the threats to the Texas economy that he says would be caused by actions to regulate and limit greenhouse pollution from fossil-fuel use. Cruz’s website calls him “a champion for Texas energy,” citing stances like his support for withdrawal from the Paris pact and for measures to reverse climate-conscious energy regulations adopted by the Obama administration.